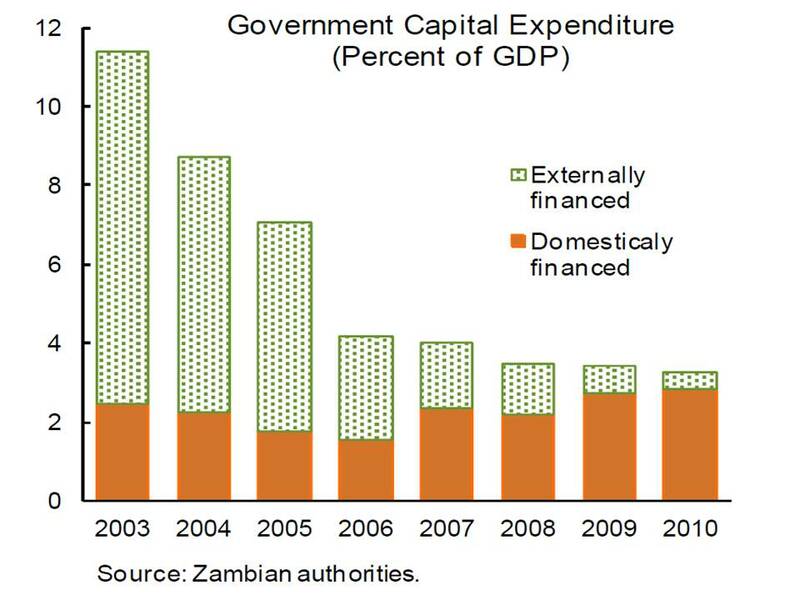 "Zambia’s key challenges resemble those of other Low Income Countries. Economic growth, although improved, has not reached the levels needed to attain the Millennium Development Goals (MDGs), nor adequately benefited the areas and sectors where the poor are most numerous. And despite weathering quite well the recent global financial crisis, Zambia can do more to reduce vulnerabilities to future shocks.....the authorities should give particular attention to four key challenges: (i) sustain the recently achieved low to moderate levels of inflation, (ii) reverse declines in capital spending and strengthen public infrastructure, (iii) mobilize domestic revenues, an area where Zambia has begun to lag comparator countries, and (iv) build on progress....to further develop the financial sector"
From the IMF latest assessment. The second point might raise eye brows (for non-regular readers of Zambia Economist) in light of the recent road projects by the Banda administration as the campaign period dawned. But actually, the general picture on infrastructure development is quite poor. We have chronicled this in the past, but this graphic from the same report drives the point - capital expenditure as a proportion of GDP has actually been falling, though the government has assumed a larger role. But obviously not enough to fill the void left by foreign funding! Without significant infrastructure economic diversification will remain a challenge - see the monthly essay Five Questions on Zambia's Diversification. There's also the problem of rural-urban infrastructure divide which we have also touched on - see The Rural-Urban Infrastructure Divide, 2nd Edition. The question is what new policies are needed to close this gap? What new policies should a new government pursue? As we are answering that question, its worth also noting that issue is not just spend more and more. As has been noted by many observers, the quality and delivery of investment is vital. Corruption and poor appraisal of infrastructure options undermines the little money we have. So is arbitrary spending of money that does not go through proper budgetary procedures and public consultation. In short we face two challenges - how do we ensure the little money we have is spent properly; and, how do we close the infrastructure spending gap both nationally and across regions? President Banda has formally dissolved the cabinet and parliament. Elections will be on Tuesday, 20 September. This period of 8 weeks of campaigns is substantially shorter than the usual convention of 12 weeks. Although the Constitution says elections should be held within "90 days of dissolution of parliament", previous presidents and all well meaning Zambians have always taken 90 days as the minimum. Indeed that was actually what happened in the bye-election. Mr Banda should have announced the date 4 weeks ago instead of going around the country campaigning and allowing Dora Siliya to travel to London on taxpayers' money. As I write she is touring Oxford Street and jumping on the "London eye" after her presentation at Chatham House today. Be as it may, we are here now. So, what should Zambians expect between now and the election date, as far as functioning of government is concerned? We expect ministers to vacate government cars and houses. We expect ministerial security to be withdrawn from them. We expect them to handover their keys. They are no longer on our payroll for the next 8 weeks. We expect the plunder of national resources will be kept to the minimum and the police and the judiciary will be efficient in dealing with any abuse. We expect a full purdah period where no announcements will be made to win political mileage. We expect the non-political machinery of government to run the affairs of the country, with the President and VP maintaining ceremonial roles unless matters of national security arise. We expect state media particularly ZANIS, ZNBC, Daily Mail and Times of Zambia, to abandon their shameless partisanship and cover all political parties fairly. Finally, we expect the leading opposition figures, principally Mr Sata and Mr Hichilema to be briefed on economic and security issues. Should one of them win, we wouldn't want them to start with zero information, would we now? How do we rescue African elections from corrupt governments? The driver knew the score all right. Politics is about money. It is this knowledge that drives people to commit murder in Kenya, the Ivory Coast or Zimbabwe – to mention just a few countries – to enable their ethnic kinsmen to achieve power. "[Dr Musokotwane] said the lesson that Zambians must learn from the privatisation of Zanaco is that they should be careful with people who encourage them to be satisfied with the status quo even when they have seen problems.."
According to the Daily Mess...Oops I mean the Daily Mail. Any the serious point is that this not the lesson. A better lesson is that an ownership model of foreign investors, workers and ordinary Zambians can be superior to either extremes of privatisation or 100% government ownership. The challenge of course is finding where different models work best as noted here. More on the ZANACO model can be found under the post ZANACO - A successful privatisation story? As a side note, one cannot escape the irony. Too eager to defend his ongoing efforts to sell Lusaka International Airport to Turkish merchants, Mr Musokotwane inadvertently suggests that Zambians have a right to seek change and should not be content with the status quo. Presumably he does not realise that this is an election year, when his opponents surely agree with him for the first time! Interesting perspectives from Kenya Airways CEO on an expanding African market still inhibited by failure to implement the Yamoussoukro Declaration. Kenya Airways of course is a good example of a successful public private partnership. The successful Ethiopians Airlines is a good model of how to run a parastatal! In both cases some element of government participation has helped rather than hindered the airlines surge on the continent. Food for thought! "You can be a scribbler or a writer or a hack. But without an adherence to democracy and human rights, you cannot be a journalist. Writers who do not accept the principles of democracy and human rights are not deserving of the name journalists but rather are paid hacks or propagandists..."
From a Post editorial on "editorial independence". We recently made the exact point here. Good to see this point being acknowledged by the established guardians of Zambian journalism. Clear water needs to be established between true journalism and charlatans working at Daily Mail and Times of Zambia. What we have now in Zambia is a journalism market for lemons. The quality of real journalists is being eroded by corrupt cadres masquerading as journalists. Many people are increasingly finding it difficult to distinguish a good journalist from a poor one. Although false journalism demeans all Zambians, it is up to true journalists to stand up and be counted. It is your profession. "In the African culture, a job that entails the killing of another human being is not considered a job at all. It is looked at with contempt and superstition, mostly because as Africans we believe that if one kills another human being the spirit of that person will return to torment its killer and his family. To the best of my knowledge I am not sure when (a hangman) will be engaged. I don’t know whether the process is in motion, but I know there is currently no hangman. Ordinary Zimbabweans are not comfortable with the death penalty. My own suggestion is that all people on death row should have their sentences immediately commuted to life imprisonment. It is psychologically traumatic and inhumane to keep people on death row perpetually..."
Zimbabwe's Deputy Minister of Justice Obert Gutu on why many people are languishing on Zimbabwe's death row. Since 2005, when Zimbabwe's last hangman retired, there has been a moratorium on executions as the country is still searching for a replacement. Apparently US$300 a month is not enough to entice people to apply! Not that anyone would responding to a job advert that says, "the job include dexterity in tying a knot and a cold-hearted person. Anyone prone to mercy or hesitation is instructed not to apply....the work will have no routine. On any given day [you] could be required to execute between two to four prisoners...". At Zambian Economist, we continue to enjoy the dawn of a new social network in the past couple of weeks: Google+. Our page has been set up for those taking part in the trial to follow - you can find us either by searching Zambian Economist or the gmail address zambian.economist@gmail.com or clicking straight to our profile page. Eagle eyed readers will also have noticed a new icon underneath each blog post that allows you to recommend our post to your friends. If you’re logged into your Google account, your +1 will show your support in a similar way to the “Like button” on Facebook or the “RT” (Retweet) on Twitter. Think of it like this, if you have a Google+ account and something that we publish benefited or intrigues you, clicking the +1 is a new and easy way for you to share your appreciation with the world. If this sounds confusing to you, not to worry, it is just one more step to keep our readership informed. We want to stay lock step with technology and not lagging behind. It has been a long while since we updated the book reading goal. That of course does not mean that I have not been reading! Quite the opposite, with the kindle, I am now reading more than before! Only problem is that there's too much to read! Plus free Kindle books continue to be a huge draw - particularly in the area of Christian literature (a top priority read). In some cases, growth has been concentrated in the natural resource sector. But mining and oil enterprises are capital intensive, meaning they create little domestic employment. They can also be difficult to tax, and only a small share of the profits is retained in the country and used to reduce poverty. The flip side of large natural resource sectors with limited employment opportunities is that the majority of the population in most African countries continues to depend on small-scale or subsistence agriculture. With relatively little investment in public infrastructure in recent decades, and limited access to financing, agricultural productivity has often remained low and households have remained cash poor. From the Kenyan government's website designed to open up government - http://www.opendata.go.ke/ . Having data and using it are of course two different things, but this is giant step in the right direction by the Kenyan government. The important of the justice system to the function of the society has been discussed extensive in our two monthly essays - Reforming Our Policing Services (April 2011); and A Poverty of Zambian Justice (June 2011). They provide useful background to the critical nature of this area and the current challenges we are facing. The MMD has no specific policy section on judicial or justice reforms. The only statement in the manifesto on this subject is that: “Zambia will not gain anything from its economic and social programmes, if there is no confidence in our judicial system, peace is threatened, illegal business activities make a few rich at the expense of the majority and if wasteful usage of national resources is not checked. The MMD government will, therefore, continue to fight corruption, by ensuring that all institutions of good governance and oversight are strengthened legally and financially” (page 45). Introduce the clerking system for all Supreme and High court judges. In addition to the above there are generic proposals related to the introduction of meritorious progression system; strengthening the judicial appointment process; and ensuring greater independence of the judges. However, no concrete proposals are outline to put meat to these aspirations. For 20 years, the MMD and its successive governments have failed to come up with a constitution that is acceptable to the great majority of our people as truly reflecting their wishes and aspirations. Why? It is simply because successive MMD governments have tried to impose a constitution that is tailored to meet their own political desires on the Zambian people. A new Vox EU reviews the performance of more than 100 countries over the past 30 years. It finds that economic freedom and civil and political liberties are among the root causes of why certain countries achieve and sustain better economic outcomes than others. In reviewing the distinctive characteristics of the 13 economies that have been able to grow at more than 7% for periods of more than 25 years since 1950, the Commission on Growth and Development (2008) found that sustainable high economic growth requires, among other things: leadership and governance; engagement with the global economy; high rates of investment and savings; mobile resources, especially labour; and inclusiveness to share the benefits of globalisation, provide access to the underserved, and deal with issues of gender inclusiveness. Law enforcement agencies have been given a go ahead to investigate and prosecute culprits involved in the land scam at the PF led Lusaka city council. Local Government Minister Brian Chituwo says law enforcement agencies have been given a go ahead to determine whether criminal charges can be laid against erring officers at the council. Dr Chituwo says the report made various recommendations on issues relating money laundering, illegal land allocations and other criminal matters. He says government will only deal with recommendations that require administrative action and allow the law to take its course too. Dr Chituwo has warned all councils in the country to desist from being selfish and unprofessional but focus on service delivery. From the Zambian people owned, but MMD controlled ZNBC. 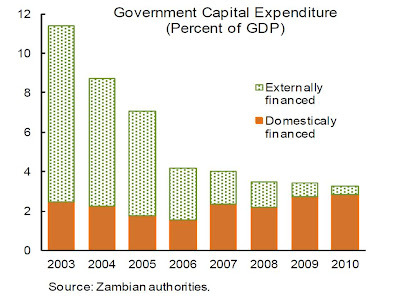 Governance and public service reform is one of the key issues facing Zambia. We have long argued that for Zambia to develop it needs to devise governance and public systems that diminishes the role of leaders to act as rent seekers; encourages fair play; and, acts in defence of the most vulnerable. The civil service and watchdog institutions are vital not only because government is the largest employer, but it is also the largest drain on resources. Billions of dollars continue to be lost through corruption. Crime continues to shackle the poor, with ever increasing abuses of their fundamental rights, as recently noted in various commentaries around prison conditions. It’s not just that the poor are sidelined in the development process, but it appears that power squarely resides in the hands of the rich who between them keep recycling power for the last five decades. Many of them are mere vestiges of a colonial era, having benefit from the spoils after independence and have not attained it through any special hard work. If Zambia is to change the entire governance and public service infrastructure needs to be re-package in favour of all. This is why this issue is important and what parties propose matter. Civil Service – There are specific commitments to re-introduce civil service examinations and in-service training as part of an effort to introduce a more meritorious system. NIPA is seen as particularly instrumental in this. Permanent Secretaries will continue to be appointed by the President but on recommendation of the Public Service Commission and subject to Parliamentary ratification. Finally, PF plans to establish “a disciplinary tribunal for constitutional office holders and commissioners in order to provide security of tenure”. Auditor General (AG) – The PF plans to enact new legislation to ensure that the AG becomes “officer of Parliament” in an effort to ensure her independence and safeguard tenure security. A cardinal development is the establishment of the Audit Service Commission (ASC) which shall be response for staff related matters. The AG’s budget will be set by ASC and approved directly by Parliament. The AG’s mandate will now include undertaking performance, forensic and value for money audits. Bhagwati believes opponents of unbridled free trade have over egged their arguments. A rather scattered article that relies on selective evidence and not a few errors. I suppose the problem always with these debates is what is meant by "free" is never defined. I have never come across free trade because trade is always anchored to something .So the line that "trade is only a facilitating device" though true runs counter to the main thesis - because in practice governments and other international structures always facilitate trade, so its never free. You need rules and regulations. Contrary to what skeptics often assert, the case for free trade is robust. It extends not just to overall prosperity (or “aggregate GNP”), but also to distributional outcomes, which makes the free-trade argument morally compelling as well. One shop in Switzerland could report that on one occasion President Chiluba bought shoes worth $500,000. A picture of his shoe-rack shows some of these objets d’art, made out of crocodile, lizard and ostrich skin, complete with the monogram FC to announce His Excellency the wearer. At some point it was found that, for lack of cupboard space, Chiluba had hired a warehouse for his six hundred suits, all from the top drawers of the top designers of the world. I was prompted to construct the tables below from the profoundly useful ZRA sources in light of the on-going discussion around the Alaskan model – and the upcoming monthly essay (for August) on “mining taxation”. It also gives a good excuse to play with table formats! Would putting money in Africans' pockets, rather than in their governments' treasuries, really reduce corruption? It probably will, for three reasons. First, it would intensify social monitoring. If you know your government is giving you ten percent of its new oil revenue, you will surely be interested in what it does with the other ninety percent. You will also want the company that explores, exploits and exports your natural resources to be managed competently -- if it fails to find, extract and sell, you lose money. You will be less patient with the public monopolies that usually control those resources and behave as self-serving, unaccountable, states-within-the-state. In fact, you will begin to wonder whether your country should get rid of those public monopolies all together, and hire experienced, private operators to work for you. “LAZ is of the view that the manner in which ZNBC is airing news and current affairs is in conflict and contrary to the provisions of the Zambia National Broadcasting Corporation Act chapter 154 of the Laws of Zambia (the ZNBC Act) whose provisions are supposed to regulate the way ZNBC operates. The situation is compounded by the fact that ZNBC currently has no board of directors and continues to operate without a board of directors, contrary to the law....The Law Association of Zambia (LAZ) has observed with growing concern that the news and coverage of national affairs by the Zambia National Broadcasting Corporation is unbalanced and mostly skewed towards coverage of opinions and activities of the ruling Movement for Multi-Party Democracy (MMD) to the exclusions of other stakeholders whose opinions are not given the requisite coverage. In addition, LAZ has also observed that ZNBC has aired libel and slander in its news and current affairs without respect for the right of persons who are the subject of the publication to respond..."
There’s little chance of this being taken seriously by ZNBC, let alone the other two members of this corrupted triplet (Daily Mail and Times of Zambia). Why? The simple truth is that they can’t. They are hostages of incentives, and those incentives point them to Rupiah Banda and MMD. Your Committee learnt [from a government response] that the prioritisation of the tourism sector was based on an economic rationale after recognising the considerable value addition and multiplier effects of the benefits that the sector contributed and/or could contribute to the national economy. These benefits include the direct ones arising from generation of jobs and creation of economic stimulus in rural areas while indirect ones include contribution to foreign exchange earnings and motivation of tourism industry forward and backward linkages. The choice also was premised on the immense prospects that subsist in the industry for wealth creation. These prospects exist on account of, among others, the rich biodiversity, abundant water bodies, spectacular waterfalls and landscapes, pristine ecosystems and rich culture. This is what we call economic bumbling. Such language does not mean anything, but designed to fool the economic illiterate – which of course excludes any of our readers. So how do we make sense of the above? Well for one thing theese parliamentarians and the government don’t know what term “economic rationale” means. The economic rationale sets out the underlying efficiency or equity failures that requires government to intervene in the sector in the manner it is doing. It is the raison d’etre based on fundamental distortion. What is it about tourism that means that it cannot get along fine on its own? What we have is just a list of undefined “value addition” and “multiplier effects of the benefits”. In other words, they don’t even what they are talking about.